Wow, this might go down as the most epic release week in quite some time. Between the highly-anticipated Oceanhorn finally being upon us, exciting sequels to two huge iOS classics in Epoch 2 and Tilt to Live 2, possibly the best digital adaptation of a gamebook that I’ve ever seen in Lone Wolf, a port of a cool looking stealth puzzler in Stealth Inc, and… well, I could go on and on. Let’s just say our collective wallets and free time are going to be under extreme duress after this week. And, something tells me this is just the beginning as the holiday rush is kicking into gear. Anyway, we captured lots of hands-on video of many of the games which you can see embedded below, as well as the normal forum and App Store links, so use those tools to your advantage as you go on a reckless spending spree with the rest of us. Send these kamikaze critters sky high to obliterate huge objects in this challenging physics-based puzzler. Get ready to step into Chicken Boy’s shoes and play one of the best action games of the year! Chicken Boy is a fast paced action game introducing the ever vigilant, slightly overweight hero the world’s been waiting for. Fend off waves of enemies across space and time. Swing your bat with intuitive touch controls and save your chicks! You awaken alone in a dungeon: you don’t know how you got there, and you don’t know how to get out. As you explore DEATH TOWER, you gain new party members, but they don’t know anything either… or do they? A surreal and paranoid story guides you through one of the deepest and most difficult dungeon RPGs ever made for iOS. 18 playable characters, 9 classes, over 50 abilities, 45 artifacts, 128 unique monsters, and 130 levels means this game will keep you busy for some time. From team Cytus, a world acclaimed music rhythm game. Rayark brings you Deemo, a hybrid of music rhythm game and the story of urban fantasy, with hand-drawn art, story-telling gallery and real instrumental feedback of piano key sound. Deemo is a mystic character lives in solitude, a castle, all by itself. A little girl falls from the sky, not knowing who she is, where she comes from. To help the little girl back to her world, Deemo comes to realize a tree keeps growing tall on top of the piano whenever it plays. What would Deemo do when it gets comfortable with the companionship it never had before? What if the little girl couldn’t deal with the truth when her seemingly lost memories regained?! Your bullets are your worst enemy in this addictive new puzzle shoot-’em-up. Loads of levels with NO IAPs or extra charges! Move around the screen constantly firing bullets and avoiding your deadly ammunition to stay alive. Sounds easy right? Think again! You’ll need quick reflexes and creative strategy to reach the next fiendishly designed level. GT Racing 2: The Real Car Experience is a true-to-life automotive journey featuring the most prestigious cars in the world! The best-selling franchise is back and it’s designed to offer an unprecedented level of driving enjoyment, whether playing solo or multiplayer. 60 hour monster training RPG…no waiting! Catch, evolve and combine 300+ monsters! Hunter Island is a real monster collection RPG with live multiplayer. From the developers of Dragon Island Blue, the former No.1 RPG in 43 Countries. Awaiting you is a vast world to explore and an epic story. Suffering from war, drought, and other unusual disasters, the island is going through troubled times, and the people living there are in need of a hero like you. In order to put a stop to these disasters, you must uncover the secrets behind the disappearance of ancient civilizations. Do you have what it takes to stop the evil plot to awaken the destructive force buried beneath the island!? Lone Wolf is back, as a video game and with a brand-new story, a new combat system, stunning graphics and much more! The world-famous author Joe Dever has teamed up with Forge Reply and Atlantyca Entertainment to create a new adventure starring the legendary Kai Lord: a new gamebook experience for long-time enthusiasts and new fans alike. The acclaimed Flash strategy hit game with over 5 Million players finally arrives on mobile, enhanced with premium content and HD graphics. The kingdom beckons to those with courage to join the King’s League. The winner will receive the coveted seat at the round table of His Majesty’s most trusted warriors. Recruit an army of over 40 unique classes including Lancers, Berserkers, and Dragoons to battle against other teams in the League. Conquer territories for resources to upgrade training facilities, promote soldiers to new classes and unlock new areas. 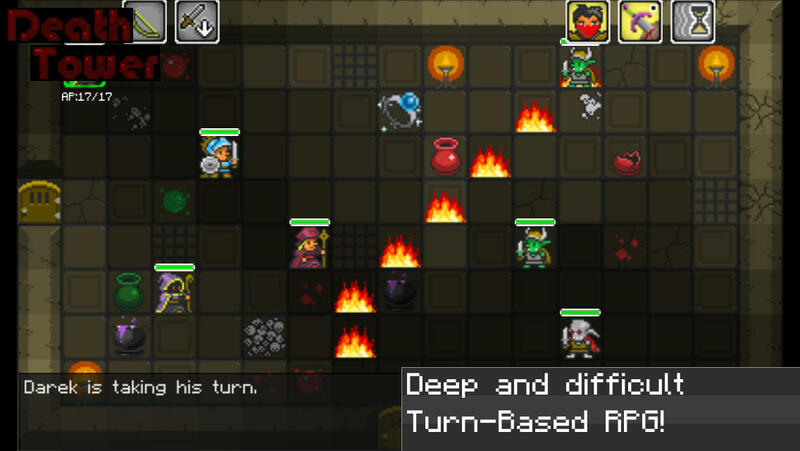 Embark on side quests, explore dungeons, and participate in the grueling Battlethon. Embark on an Odyssey, make that first step – the King awaits you! You wake up and find a letter from your father. He is gone… The only lead is his old notebook and a mysterious necklace. What happened? Explore the islands of Uncharted Seas, a world filled with many dangers, puzzles and secrets. Fight monsters, learn to use magic and discover ancient treasures which will help you on your quest. Use all your wits and skill to unravel the mysteries of ancient kingdom Arcadia and sea monster Oceanhorn. Oceanhorn combines captivating storytelling, breathtaking 3D visuals and exciting gameplay into one massive action adventure experience you will never forget. The Rivers of Alice is a graphic adventure that takes place in a world of riddles and characters inspired by the music and lyrics of vetusta morla. Whenever Alice falls asleep, enters in a fantasy world in which the player must help her to face their fears. Sloth, Envy, Patience… A leisurely game to play, enjoying the beautiful pictures and the soundtrack composed expressly for the music group. Stealth Inc is a fast-paced stealth platformer featuring brutal hazards, ruthless enemies, fiendish puzzles and red pixels galore. Jump, sneak, and be chunked through 80 levels. Will you make it out alive? Armed with only your wits and a pair of top of the range Stealthing Goggles, it’s your job to sneak your way through a deadly facility that’s determined to extinguish your fragile little life. With no weapons and no armour, being seen means instant death. Stay out of the light to avoid the attention of deadly security robots! Leap like a lusty salmon to avoid those zap-happy lasers! Think fast as the walls close in around you! Only the fastest and sneakiest will make it to the exit. Will you be among them? The futuristic successor to the award wining Legendary Wars series! Join the last remaining robots on a quest to rebuild a lost civilization in a mysterious new solar system. Things quickly change when the bots find themselves in the middle of a war for the future of the Galaxy. Take to the skies in your Stellar Fighter! Build a large cast of customizable robots and take on hordes of aliens in a unique blend of Strategy Defense and Sidescrolling Space Ship Shooter. The fate of the Galaxy is in your hands! Fans spoke! We listened. “Sunday Lawn Seasons" is the highly anticipated sequel to fan favorite “Sunday Lawn", but with THREE new seasons! After a flourishing summer with his lawn mower, Charlie expands his summer job into a YEAR ROUND BUSINESS. Faithful to the game play of the original Sunday Lawn, this all-new sequel packs on new gardens, graphics, features and animals. Usually when you see a description of a sequel that starts with “The two main characters are back and bigger than ever" it’s a sure sign of a cash grab. Andre and Liselot are back, and this game is bigger than ever! Super Lemonade Factory Two has more of everything you loved about the first, more zany dialog, more gorgeous pixel art and more spikes. Taking place around the globe in Sydney Australia, New York City and a military base. NEW! Discover and play through the first Act of Joe Dever's Lone Wolf FOR FREE!